The Wall, Mr. Dependable and Mr. Reliable. B.com. from St. Joseph's Boys College. Karnataka, India, ACC Asian XI, Scotland and Kent. India vs. Sri Lanka, Singer Cup , 1995/1996. India vs. England, 2nd Test at Lord's, 1996. Happily married to Vijeeta Pendharkar. Parents - Sharad (worked for Kissan) & Pushpa Dravid (received PhD in art). 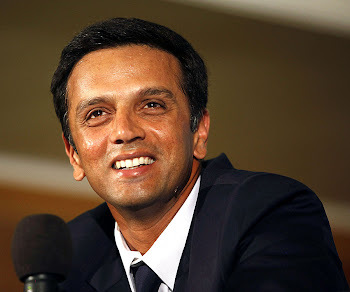 Siblings - Younger brother Vijay Dravid (did engineering and also plays cricket). Wife - Vijeeta Pendharkar (practicing surgeon in Nagpur). Children - Two sons - Samit (2005) and Anvay (2009) . Parents and coach Keki Tarapore. Concentration and ability to stay cool. Braveheart, Ghost, and Rocky (Hindi). Tom Cruise and Aamir Khan. Julia Roberts, Demi Moore, Michelle Pfieffer and Manisha Koirala. Sting, Chris de Burgh, Kishore Kumar, and Lata Mangeshkar. I believe I can fly by R. Kelly, Could you be loved by Bob Marley, Greatest love of all by Whitney Houston, Because you loved me by Celine Dion, O Sanam by Lucky Ali, and Afreen Afreen by Nusrat Fateh Ali Khan. Chicken tikka masala, daal and rice and anything mom cooks. Shezaan, Karavalli, and Paradise Island. Sandton Sun (Johannesburg, South Africa). G.R Vishwanath, Sunil Gavaskar, Kapil Dev, and Martin Crowe. Sachin Tendulkar, Javagal Srinath, Azharuddin, and Steve Waugh. Murali Karthik, Ajit Agarkar, Harbajan Singh. Micheal Jordon, Prakash Padukone, V. Anand and Pete Sampras. Third Test against West Indies at Barbados. When India failed to chase 120 against West Indies in the 3rd test at Barbados in 1997. To play for India and win many Tests abroad. Doesn't remember what he dreams. Cried in the dressing room after getting out in a junior match and his friend laughed at him. Gundappa Viswanath, Sunil Gavaskar, Dilip Vensarkar, Vijay Merchant, Syed Kirmani, Tendukar, Javagal Srinath, Anil Kumble, Kapil Dev, Erapalli Prasanna, and Bishen Bedi. Its SAMIT and not Sumit as you have spelt.